Actually I find the site pretty great. A little slow loading eg.the menu roll over effect doesn't show quickly. 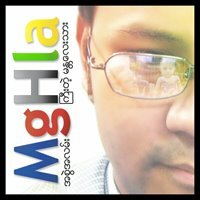 Apart from that very professional looking site and it's one of the best myanmar sites I've come across. A great job done indeed from a person with little experience on webdesign. Some suggestions though, need to add meta tags for better search engine hit. ie. Also song lists and other mm descriptions are all images and take quite awhile to load. Since you are using mm unicode ponya very well here, you should try to use there as well. Alot more easier to make changes/update and loading is faster. Nah...those are just minors and dont even need to worry. I really like the site and thanks for making it available.